Dirty carpets can be annoying, costly, and above all, can be very dangerous for all the people inside the home. Dirty carpets can be a source of collected dust, molds, and even viruses and dust mites, along with various other infectious and dangerous organisms. This is often why carpet owners want to stay on top of things and aim to hire carpet cleaning professionals at least once a year to have their carpets cleaned out. However, not everyone claiming to be a carpet care professional is one, and sometimes, owners fall into the trap of scams and schemes. This is the kind of scheme that happens when you hire a carpet cleaning company, which seem to be doing the job for a lower price than the usual ask. This isn’t a good thing, no matter how lucrative it might be, because these low process are usually covered by hidden costs in your bill that will come and haunt you later on. An example of this is cleaning out the carpet and then telling you their sum total doesn’t cover the cost of the products they used. Additionally, they may not do their work as efficiently as you’d expect and leave your work half-done. Because of all of the hidden costs in your bill, you may actually find a bill well over what you expected. This can be very frightening, especially for the seniors who are the most likely victims of these scams. However, anyone can be at risk of falling for these schemes. You can avoid a lot of the trouble that comes with these schemes by being quick to identify certain traits that are common amongst fraudulent carpet cleaners. One way of noticing this is that these cleaners would arrive in a vehicle that doesn’t seem associated with their company. They may even not be in uniform, and may not be carrying any kind of license of certification. If they don’t provide you with any kind of proof about their work, their company, or about themselves, simply don’t let them into your home. 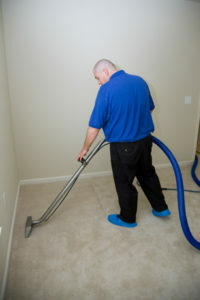 Another way for you to protect yourself may be to be extra vigilant when you are hiring someone to clean up your carpet. Not just that, you should carefully consider their answers and how they choose to answer. You have every right to ask them for a license proving their expertise in the matter, or for certifications relating to their work, so do not shy away from requesting any kind of proof. Furthermore, you can even request them for lists of their references and check their employee screening method. If any of their answers make you suspicious, don’t hesitate to look for someone else to do the work for you. There are plenty of carpet cleaning companies out there and a good number of them will be able to provide you with the services you need.